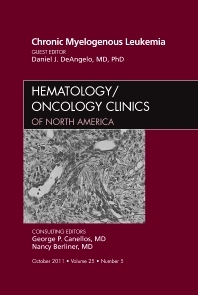 Dr. DeAngelo has assembled top experts to write state-of-the art reviews on the management of chronic myelogenous leukemia. Some of the articles that will be of most interest to readers include: Hurdles Toward a Cure for CML: The CML Stem Cell; The biology of CML progression: Who, what, where, and why? ; Chronic Myeloid Leukemia – Mechanisms of Resistance and Treatment; BCR-ABL mutations in CML; Selection of therapy: Rational Decisions Based on Molecular Events; Chronic myelogenous leukemia: Role of stem cell transplant in the Imatinib era; Portal Vein Thrombosis and Budd Chiari Syndrome.